From the Warp: Heroes of Armageddon: Weekly Drawing! Heroes of Armageddon: Weekly Drawing! 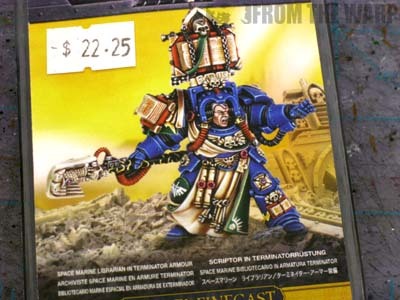 I am happy to announce that as part of the Heroes of Armageddon Project, this week's drawing will feature a brand new Finecast Space Marine Terminator Librarian model to be painted and based in the choice of the winner. That's right, I am offering up my humble painting skills to one lucky winner. I will paint this guy and base him up to match the winner's choice of paint schemes so it can be added to their existing army with ease. I mean doesn't everyone play Space Marines? What other armies are there? All kidding aside... I'll be painting this guy up to match the winners request and shipping him out to them at absolutely no cost to the winner. All they have to do is let me know the color scheme. I am fortunate that my local FLGS, Game Vault has been kind enough to donate the model to the Heroes Project. They were there for us with the Storm Wardens project and were more than happy to come aboard again this year. So how do you win this guy? You get your name added to the drawing pool by contributing to the Heroes of Armageddon Project and helping Doctors Without Borders. By contributing, not only are you added to this week's drawing, but all the following drawings and the final grand prize as well. And the more you contribute, the better your chances of winning. Simply head over to the Heroes of Armageddon site and in the upper right hand column you'll find the contribution button to get started. If you've already contributed, you're already in the running. But I'll tell you that it can't hurt to push the odds in your favor by contributing again. John from Santa Cruz Warhammer will be drawing the winning entry on this Sunday so don't wait until the last minute to make sure you're in the running. Once he announces the winner and let's me know, I'll be in contact with you to work out the particulars for your brand new model. And lastly, I want to say thank you to everyone who has contributed so far. Without you guys, we would not be able to help Doctors Without Borders like we do. This is probably the best way to get people to donate. I mean I did because that would be awesome to win. nice, looking forward to your input on the whole finecast experience, I have yet to meddle with one. and thanks for the great prize. Dave: Thanks, hopefully it will generate some interest. 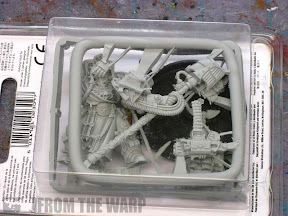 Reid: I've always wanted this model myself so I figured it would make a nice addition to any Space Marine army. SC John: I'll be making notes on it for sure. I've already started writing down my thoughts on the differences between this and metal. Flekkzo: That's what I don't get... it's called "Finecast." You'd think that would mean something.